The changes in the slopes of the sea-surface and thermocline along the Equator in the Indian Ocean, mentioned in Section 5.2.2, occur surprisingly fast. Exactly how fast the ocean can respond to seasonal changes in the wind has been studied in the simpler and steadier Atlantic, where the stress of the South-East Trade Winds across the equatorial ocean causes the sea-surface to slope up towards the west, and the thermocline to slope down (cf. Figure 5.3). In the Atlantic, the South-East Trades are at their weakest during MarchApril and at their strongest during August-September. 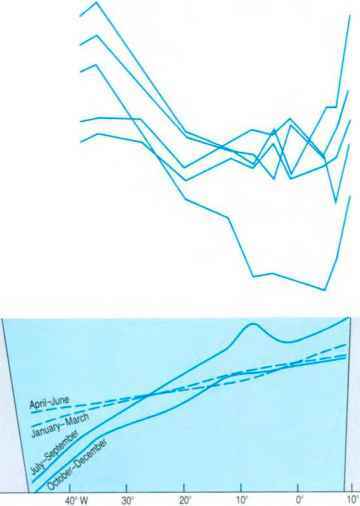 Figure 5.15 shows how the slopes of the sea-surface and thermocline across the Atlantic basin vary over the course of the year. Figure 5.15 (a) Seasonal variations in the height of the sea-surface across the equatorial Atlantic. (The curves appear jagged because they are based on mean values at particular longitudes.) (b) Seasonal variations in the depth of the 23' isotherm across the equatorial Atlantic. [Jo the minimum and maximum slopes of the sea-surf ace and thermocline correspond to the periods of minimum and maximum wind stress, respectively? Figure 5.16 Examples of (a) a 'surface' long wave and (b) a long wave in the thermocline, here shown as a sharp boundary between less dense surface water (light greenish-blue) and more dense deeper water (darker blue). In (a), the surface ocean as a whole moves up and down, and isobaric and isopycnic surfaces remain parallel. Such waves are therefore described as 'barotropic'. In (b), the passage of the wave changes the vertical density distribution, so that isopycnic surfaces are alternately compressed and separated. In addition, there are pressure variations over the surface of the density interface (the light greenish-blue/dark blue boundary) so that isobaric and isopycnic surfaces intersect; such waves are therefore described as 'baroclinic'. Yes. they do. as far as the monthly mean values in Figure 5.15 allow us to tell. The important point about this is not the correlation itself but the fact that it indicates that the upper waters of the Atlantic Ocean respond very quickly indeed to changes in the overlying wind field. This fast response time cannot be explained simply in terms of water being transported across the equatorial Atlantic and 'piling up' at the western boundary: the upper ocean as a whole must somehow adjust to the overlying wind and to the fact that there is a boundary along the western side of the ocean. In other words, the ocean in the central and eastern parts of the basin must in some sense 'know about' or 'have felt' the western boundary. The way in which the mid-ocean receives information about the existence of a boundary is through perturbations or disturbances that travel through the ocean as pulses or waves. This is analogous to the way in which we receive information concerning the world about us - through light waves or sound waves. These wave-like disturbances not only enable water in mid-ocean to respond to the existence of coastal boundaries, they also transmit the effects of changes in the overlying wind field from one region of ocean to another, and do so much faster than would be possible simply through transportation of water in wind-driven currents. It is believed that the speed of the reversal of the Somali Current is one example of such an effect: as described in Section 5.2.2. the surface waters off Somalia flow fairly fast south-westwards during the North-East Monsoon, but can nevertheless be moving very fast in the opposite direction only a few months later. This dramatic 'switch' is thought to be possible because the upper ocean off eastern Africa 'feels' the effect of winds blowing in the central region, as well as being directly driven by local winds. Various different types of waves may be generated in the ocean. We are all familiar with the wind waves which occur at the surface of the ocean, in which particles of water are displaced from their 'normal' or equilibrium position in a vertical direction and return under the influence of gravity. The types of gravity waves that are of interest as far as ocean circulation is concerned have wavelengths which may be anything from tens to thousands of kilometres, periods ranging from days up to months, or even years, and vertical displacements which vary from centimetres up to tens of metres. 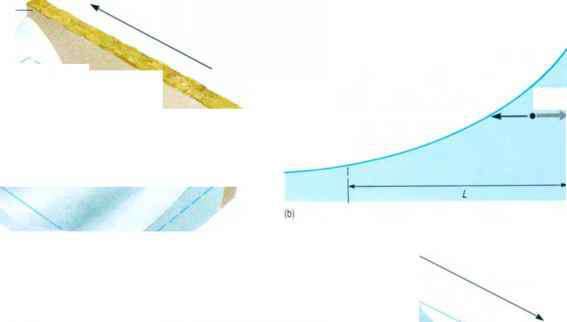 These vertical displacements may be more or less constant with depth (Figure 5.16(a)): alternatively, they may be greatest where there is a strong vertical density gradient - in the thermocline. for example (Figure 5.16(b)). In the first case, the vertical density distribution is not affected by the passage of the wave, and so if isobaric and isopycnic surfaces are initially parallel to one another, they will remain so (Figure 5.16(a)). For this reason, such waves are sometimes referred to as 'barotropic waves'; we will refer to them as 'surface waves' although it should be remembered that motion associated with them extends to significant depths, because their wavelengths are much greater than the depth of the ocean. 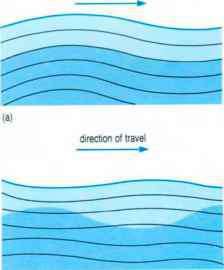 In the second case, the vertical density distribution is affected by the passage of the waves, so that density surfaces are caused to intersect isobaric surfaces (Figure 5.16(b)): such waves are therefore referred to as 'baroclinic' waves. Baroclinic waves generally have much larger amplitudes than surface (barotropic) waves. Because these disturbances have very long wavelengths and periods, they are significantly affected by the Coriolis force. As a result, motion occurs in a horizontal as well as a vertical direction. This may be seen most clearly in the flow patterns associated with Kelvin waves and planetary or Rossby waves, the two classes of waves that are most important as far as ocean circulation is concerned. A general feature of all wave motions, through water or any other medium, is that where the physical characteristics of the medium change with position, waves seeking to cross the line of change may be reflected, or in some other way deflected, so that they become trapped within a wave guide. 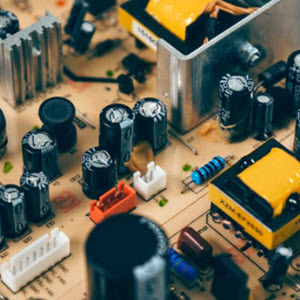 Common examples of wave guides employed in communications technology are optical fibres and coaxial cables, both of which are used to carry information along a specified path. An example of a wave guide in the ocean is the sound channel, a depth zone where the velocity of sound in seawater is relatively low, and within which sound waves may be trapped by refraction (Section 4.3.3). Sounds emitted in the sound channel - by, for example, Sofar floats - are transmitted over distances of thousands of kilometres with relatively little attenuation. Now imagine a parcel of water in the Northern Hemisphere, moving northwards with a coastal boundary on its right. The Coriolis force continually tends to deflect the parcel to the right, but because the coastal boundary is in the way, only limited deflection is possible. Water piles up against the boundary, giving rise to an offshore horizontal pressure gradient force; this keeps the parcel of water moving parallel to the coast, in a geostrophic current. Consequently, a coastal boundary constrains the way in which water can move in response to the forces acting on it. As a result, coasts may act as wave guides to the perturbations known as Kelvin waves (Figure 5.17(a)), which can travel as surface (barotropic) waves or as baroclinic waves. In a Kelvin wave, perturbations of the sea-surface or of the thermocline propagate parallel to and close to the coast, as though unaffected by the Earth's rotation, because the Coriolis force directed towards the coast is opposed by a horizontal pressure gradient force that results from the slope of the sea-surface. Thus, a necessary condition for the propagation of Kelvin waves is that the horizontal pressure gradient force and Coriolis force act in opposition. Kelvin waves are similar to surface wind waves in that the principal maintaining force is gravity. Particle movement within the wave is such that the amplitude of the vertical displacement is greatest at the coast and decreases exponentially away from it, so that at any point and any time the Coriolis force balances the pressure gradient resulting from the slope of the sea-surface (or thermocline) (Figure 5.17(b)). Figure 5.17 (a) Schematic diagram of a surface Kelvin wave in the Northern Hemisphere. In the case of a Kelvin wave in the thermocline, the thermocline would adopt the shape shown, while the sea-surface would take on a similar shape in 'mirror image', although to a much lesser extent. (b) Diagram to show the horizontal balance of forces in a Kelvin wave, and the Rossby radius, L (which is discussed in the text). (c) An equatorial 'double' Kelvin wave (here shown for a surface wave); the wave travels from west to east.